Oil on canvas, 102 x 81 cm. Jens Juel has carried out a number of enchanting portraits of mothers with children and family portraits. But only very rarely did he paint fathers with their children. 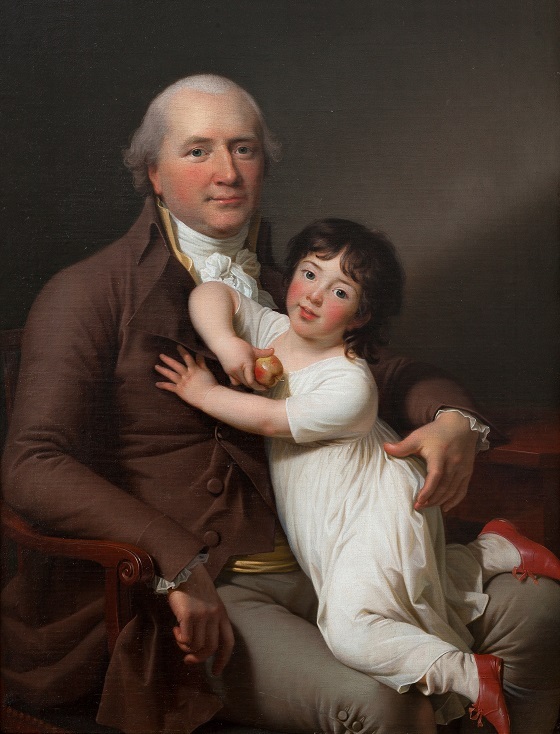 Merchant and shipowner Peter Tutein is shown as a loving father with his son crawling on his lap. According to current trends, it was thought that children should be brought up along the principles of French philosopher Jean-Jacques Rousseau, who advocated freedom and naturalness. Rousseau helped establish the belief that children have their own way of seeing, thinking and feeling. They should not be treated as small adults, but brought up in accordance with their nature. Jens Juel was the leading portraitist in Denmark in the 1700s. He received his primary training in Hamburg, where he was influenced by the city’s bourgeois taste in the Dutch painting tradition. Back in Denmark, Juel won the Academy’s gold medal in 1771 and the following year, he received a stipend to study abroad, which led him to Germany, Rome, Switzerland and Paris, among other places. The artist received many portrait commissions from the bourgeoisie and nobility in particular, and he quickly became the country’s undisputed court painter. His portraits are characterised by his empathetic portrayal of humans. Juel was also an excellent colourist and his portraits display notes of elegance, figurative simplicity and psychological qualities.